LESY is a luxurious Italian clothing brand that was established in 1964 in Florence. Originally the line was fabricating exclusive clothes made by hand. But after creating the first collection, it has become very popular not only in Italy, but in other countries as well. Now the LESY line in famous in Europe, Asia and the United states. 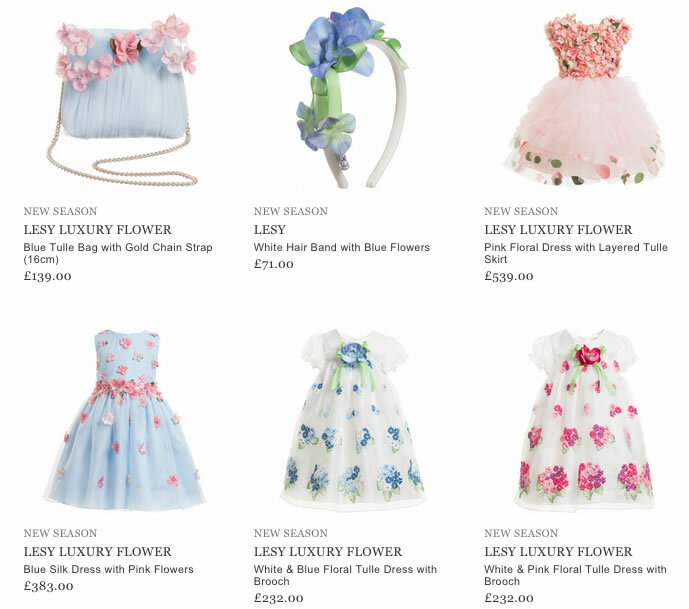 The company is focused on making wonderful and unique outfits for girls aged 12 months to 16 years. It tries to convert a young lady into a real princess, always proving her with luxurious look. The creative designers embody their extraordinary ideas in creating wonderful dresses. Bright and vivid colors prevail in every new collection of the brand. The manufacturers pay great attention to adding special lovely details and elements to make the appearance of a girl more feminine and delicate. The items are embroidered mostly with colorful flowers, but pleats, ruffles, sequins and silky ribbons are used as well. The LESY brand also represents a big variety of hair accessories; among them are cute hair bands of stunning design. Besides, to match the whole look, the designers offer nice bags. Nowadays parents are able to purchase the products of LESY online.